When you talk to an average dentist about x-rays, it’s like talking to a car salesman. They never indicate there are risks or negative aspects, only if you address them directly. And then, they downplay the risks, it’s all safe and good. You keep pressing your answers, you’ll get the response “here’s another nervous patient…” So it’s either “do as I say” or you are a paranoid, nervous freak who is “scared” of radiation. Apparently you have no more rights when you enter that dentist door, you have to give up all brainpower and let them take over all do all the decisions. Oh yes, and hand them your credit card, above all! I doubt the average dentist is aware of the studies listed below and he/she will like downplay all the findings as “not relevant”. After all would you feel comfortable with the thought that your work might cause someone else to develop cancer? So obviously, they dive into denial rather than open dialogue. During my PhD I learned one thing in particular that was very useful: during my dissertation research I read a lot of studies and learned how they are designed. Medical and social sciences use different study designs than other faculties and areas of research. And each type of study is relatively easy to manipulate, in its own particular way. In the Western world we have developed this collective thinking “science is always right” and if you go against “science” you are an idiot. Hence, the obvious way to brainwash the nation is to call something a “scientific finding”. When you hear “the science is clear” you should already expect a great dose of brainwash is coming your way… Science is almost never clear on anything, as every finding and every study can be disputed at least in part. Each study design has its own strengths and weaknesses. And each field of science has its own shortcomings and areas where it can be manipulated for monetary gain. Studies can be easily manipulated at various stages. Studies are also peer-reviewed and published in academic journals or industry publications. Often those “peers” have been educated in the same field, in the same country, perhaps their universities are receiving “grants” from the same corporations in the same industry sectors. Sometimes you can see how universities, for example, manipulate their image by publishing more “scientific” findings. Especially in new fields of research, publications can be completed at a lower cost. So universities pump out sometimes nearly meaningless papers just to increase their number of publications. They publish each other’s work, well because they are after all partners. And within a short few years, several universities can stand out as “leaders” and “authorities” in a particular field of study, simply by publishing, promoting, and citing each others work. The actual value and quality of the scientific information published doesn’t necessarily matter. Because people tend to blindly trust “science”, the world of academic research, especially in the trillion dollar medical fields, has become an extension of the marketing and PR departments of the pharmaceutical industry. People who now work for the FDA used to work in the industry. The industry has thus an easy way to manipulate what the FDA does. Take for example the subject of mercury fillings, aka amalgam fillings. One single filling contains 1-2 grams of pure mercury and is placed directly into the mouths of children! If you took a small bottle of mercury and dumped it into the Chesapeake Bay they would throw you in jail and perhaps put you on the evening news “look here, the environmental terrorist!” But in the mouth of your four year old, mercury is perfectly fine. The FDA and ADA also still to this day say mercury is “safe”, when scientific evidence is plenty and shows multiple adverse health effects in the long-term. Norway, Sweden, and Denmark have completely banned amalgam fillings, but in the U.S. we have a much stronger lobby, it’s way stronger than brainpower. Another issue must be that people simply and blindly believe their dentists, the “authority”. Sometimes you have not much of a choice either. When I contacted to the first dentist, who works near my house, and told him I oppose mercury fillings, I was told “it would be better if you find a dentist who is more compatible to what you are looking for”. What!? And when most dentists around you think and act the same way, where are you going to get your teeth fixed? Back to the manipulation of studies: how can it be done? A very effective method is to change the set up in a way that only the desired outcome can possibly occur. For example, you treat the group with a very low dose or you use a version of the substance that is known to be less effective than another, more commonly used one. For example, Vitamin C “research” by big pharma will always use very low doses that are almost useless in treating or preventing anything. Vitamin E “studies” commonly use the synthetic form of Vitamin E and a lower dose rather than the natural form of Vitamin E. Supplement related studies often treat vitamins as if they were pharmaceuticals and test them in isolation; however, vitamins work in combination and not so much as isolated agents as a synthetic pharmaceutical would. So basically when you see a new study come out trying to disprove the findings of another, especially if the previous study affects monetary gains of an entire industry, you got to dig deeper and see who paid for it, which university or institution, where does this university get its grants from, etc. Who would benefit from the “new” results and interpretations of data? Before you go ahead and dismiss older studies because the x-ray machines emitted more radiation “back then”, please keep in mind that today your dentist is likely to take 20x more x-rays than 30-50 years ago…. Today dentists usually x-ray you every 3-6 months without any valid medical reason, just to keep their staff and machines busy…and pockets full. You can also thank your insurance for this trend. Perhaps back then dentists had the desire to minimize your radiation exposure, perhaps out of empathy with you and your children. Perhaps back then the insurance wouldn’t pay for more than one x-ray! Well today that empathy is surely lost and gone for good…and it has been replaced with the desire to “earn” more money, and also a blind faith in the ADA/FDA. de González, Amy Berrington et al. Association of brain cancer with dental X-rays and occupation in Missouri. Department of Preventive Medicine, University of Kansas Medical School, Kansas City 66103. Medical and dental x rays as risk factors for recently diagnosed tumors of the head. 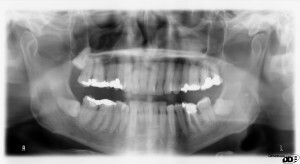 Memon A, Godward S, Williams D, Siddique I, Al-Saleh K . Dental x-rays and the risk of thyroid cancer: a case–control study . Acta Oncol 2010; 49:447-53 . J Neurosurg. 2012 Dec;117 Suppl:78-83. doi: 10.3171/2012.5.GKS12615. Han YY1, Berkowitz O, Talbott E, Kondziolka D, Donovan M, Lunsford LD. Dental diagnostic X-ray exposure and risk of benign and malignant brain tumors. Ann Oncol. 2013 Jun;24(6):1675-9. doi: 10.1093/annonc/mdt016. Epub 2013 Feb 13. Lin MC1, Lee CF, Lin CL, Wu YC, Wang HE, Chen CL, Sung FC, Kao CH. A prospective study of medical diagnostic radiography and risk of thyroid cancer. Am J Epidemiol. 2013 Apr 15;177(8):800-9. doi: 10.1093/aje/kws315. Epub 2013 Mar 25. Neta G1, Rajaraman P, Berrington de Gonzalez A, Doody MM, Alexander BH, Preston D, Simon SL, Melo D, Miller J, Freedman DM, Linet MS, Sigurdson AJ.